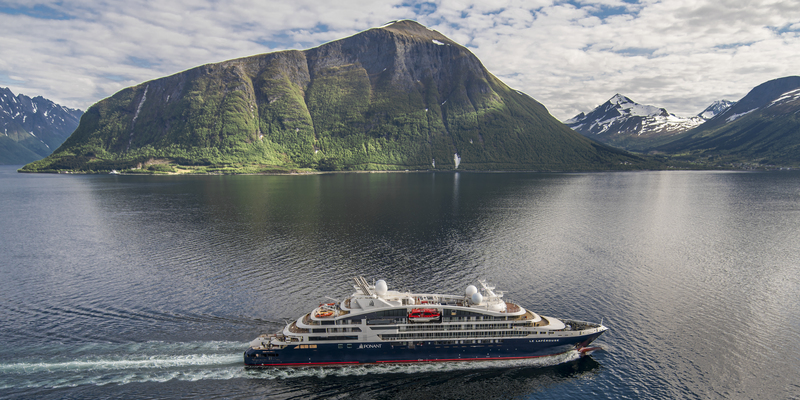 Ponant has taken delivery of Le Lapérouse, the first of six new ships that will feature in the Ponant Explorers series. Which we think is fantastic news to kick off your weekend! Le Lapérouse left the shipyard in Ålesund, Norway, on 16 June. The ship reached Reykjavik in Iceland on 19 June for the start of her maiden cruise. The inauguration will take place on 10 July in Reykjavik. “Le Lapérouse is a wonderful achievement for the company and the result of intensive teamwork with Vard and Fincantieri,” Jean Emmanuel Sauvée, CEO and Co-Founder of Ponant said. Of a smaller capacity with just 92 staterooms and suites all with a balcony or private terrace, the ship has an elegant design, a long sleek line, state-of-the-art technology and major innovations. Also designed to respect the environment, Le Lapérouse has been dubbed by the cruise line as a true symbol of a new generation of ships flying the French flag. The six Ponant Explorers will also feature a world first innovative multi-sensorial underwater lounge, the Blue Eye. The Blue Eye will allow passengers to discover and experience the underwater world via two portholes in the form of a cetaceous eye, looking out on to the seabed with non-intrusive underwater lighting, and hydrophones integrated into the keel that retransmits the natural symphony of the deep water. The lounge will also feature Body Listening sofas, offering a unique sensorial listening experience by corporal resonance. Which sounds pretty relaxing if you ask us. Construction of the other five ships is currently underway. The 2018 Women in Travel Power List unveiled! What has loads of great deals, several new ships, an International Women’s Day celebration and took three cups of coffee to write? It’s a bumper cruise wrap!